Presenting flowers to near and dear one is the best way to express the emotions of the heart. One can clearly showcase their most profound emotions by simply sending a bouquet of gorgeous flowers in Darjeeling. Winni has come up with its vast range of flower in different amazing arrangements which can easily win the heart of your loved one and fill them with joy. Now there will be no reason for the gloomy face of your dear ones due to your absence on the special occasion. You can mark your presence by sending lovely flowers online from Winni. So, delight your relationship by sending flowers to Darjeeling. The beauty, charm, fragrance and elegance of flower is merely bewitching which win the hearts of receivers instantly. Our vast range of flowers in gorgeous arrangements is sure to melt anyone's heart. Send flowers to Darjeeling to the doorstep of your beloved and tell them that they are special for you. The pleasant aroma always manages to bring a smile on your loved one’s face. Whenever you need to express your love, care and affection to your dear ones, you can always choose flowers as a lovely gift. Now, Winni comes with its great online services and hence you can send these flowers online to Darjeeling for your special ones. Just look at Winni’s attractive collection of roses, gerberas, lilies, orchids, exotic flower arrangements and mixed flowers in bouquets, bunches and basket arrangements. Here, you can find a lovely flower arrangement for Valentine’s day or any other special day, so that you can win the heart of your partner by giving these flower. Just imagine the million dollar smile on the face of your beloved one when they receive the Valentine flowers from your side. To being with you at your worst time, give flowers to your loved ones and say thank you. Giving flowers is best to show respect to someone whom you adore. Winni is always here to help you to delight you every day . Surprise your near and dear ones by sending these lovely flowers online from Winni in Darjeeling and create sweet memories with them. Different color of flowers has different meanings which easily express love, care and affection. They are gorgeous creation of nature and they are the ideal gift from years that can win the heart of everyone. Flowers add grace in the occasion and fill the receiver with complete happiness. Our beautiful collection of flowers are best for all the time celebrations whether it is the time of birthday party, wedding day, anniversaries, get together with friends or to make feel special to your partner. But when you are away from your family or loved ones, what will you do? In that case, just visit our website Winni.in, choose your desired flower bouquets and send to your loved ones living in Darjeeling. Winni provides the home delivery services and guarantees to delivers your flowers at your convenient time and at the right place in Darjeeling. 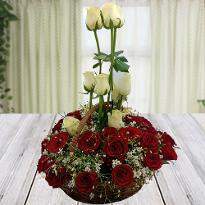 Whenever you want, you can send these flowers your special ones with just a few clicks at Winni.in. more than, you can send these flowers at midnight by selecting the given option at a website. Even you can send these flowers randomly to your loved just to remind them of your love and mark your presence felt by them. Even you are away from your family, friends, relatives or beloved one, Winni is always here to wipe the distance with its home delivery services. So, don't worry about the happiness of dear ones! Order flowers or flower bouquets online from Winni and get them delivered in Darjeeling.